This article by our own cura te ipsum (who is a currently practicing physician) has been #1 on the google search "doctors against universal health care" for quite some time, generating hundreds of views. If the government cannot provide comprehensive and efficient healthcare on a smaller scale i.e. Medicare or Medicaid, how can it provide sufficiently for every American? Take a look at government healthcare so far. Medicare is a broken system. It was bankrupt by 1972. Since then physicians who accept Medicare have had to face ever-worsening financial garnishment on reimbursements forcing many doctors to stop treating Medicare patients altogether. Primarily, elderly patients are seeing restrictions on the amount of care they can receive and with the aging of the baby boomers, demand will increase and this is only going to get worse. 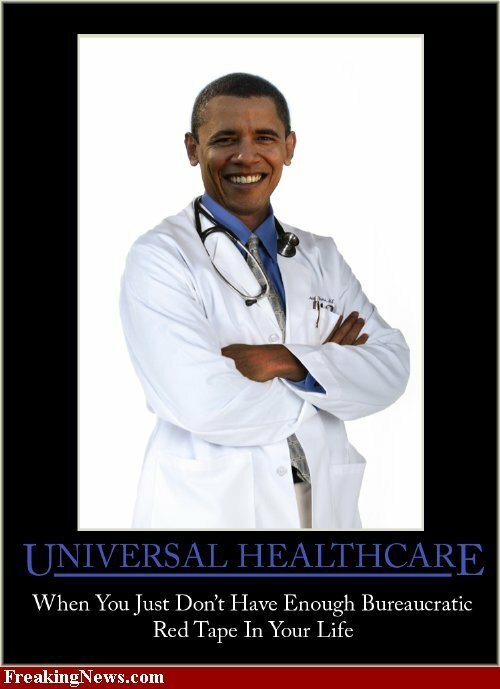 Furthermore, the overwhelming financial expense of universal healthcare will eventually result in the some type of healthcare rationing. How is this possible? President Obama has already been laying down the framework for the Comparative Effectiveness Research (CER) council. This means that all your care is analyzed in a computer database to compare cost effectiveness against other types of care (I doubt my patients would like their medical history to be part of this national experiment). If at any point the computer says your care is too costly, the treatment options available to you will likely be diminished. You may even incur penalties if you engage in any sort of “risky” behavior such as overeating or riding a motorcycle. The CER also involves bureaucrats influencing doctor’s decisions by initiating a process that can result in non-reimbursement for care. When this happens, and reimbursement doesn’t match the effort or quality care that a doctor gives, there is little incentive to provide better quality care. Obama warned that physicians will have to "tighten their belts”. If you want to know what that looks like, just ask the U.K. They drove many of their doctors, especially their dentists, to other countries where they could get reasonable reimbursement for their time and education. When doctors leave and fewer students go to medical school, the country is left with a provider shortage. This reduces timely, quality care and causes further rationing, which also drives up the cost of getting drugs (especially expensive ones like those for cancer). This has already been seen in other countries. Here is a couple examples of what the UK and Canada have to say about their socialized medicine. Click here for hundreds of examples. Maybe with normalized relations with CUBA the US could overnight solve their doctor shortage with cuban doctors - good doctors too!! How come the US military has great socialized Govt run healthcare and that is not good enough for the rest of its citizens? Surely, It's a matter of just pooling the risk - cooperating, setting priorities. I don't understand the political objections. Bring down the cost of doctors and ban drug advertising- eat healthy and exercise - make a will - travel to Iran - get to know the people you are about to bomb. I guarantee the American people will be happier and healthier. The rest of your claims would be clearly ridiculous to you if you understood economics at all (except the part about flying to Iran. Yes, the people are generally nice but the government wants to destroy America.) I suggest you read back on some of the articles on this blog to understand what you are talking about when it comes to “risk management” and “pooling resources.” When you follow free-market principles it encourages drug and technology innovation and affordability. Not everyone can shop at Nordstrom’s (or worse, has a “right” to), but places like Walmart will provide affordable alternatives that meet needs without destroying the system. If the government stepped in and coerced Nordstrom’s to lower their prices and took money from the rich to pay for the poorer’s shopping spree, Nordstrom’s would refuse to stay in business and there would be shortages on goods, services and no development. Yes, health care is much more important than shopping for clothes (though it may not be for a large groups of people), you still can’t cheat economics. You don’t want to work for free and neither do doctors. They have given large chunks of their lives to studying to become doctors and they expect compensation. And the more you tax the rich the less they want to produce, and our economy goes down the tubes. And the more government debt we rack up, the more we enslave our children to our debtor, China. are you serious about bringing cuban doctors to america or are you being sarcastic? after what happened in britain when they brought in foreign doctors who ended up botching hundreds of surgeries, how can you even consider that? you must have been duped by michael moore who, if you haven't noticed, is still living in america and using american healthcare despite his derision of it. as far as your comment about american military healthcare, i hope you're not referring to va hospitals. maybe you should actually spend some time in one before you go touting its triumphs. i promise you it will be an eye opener. it's very sad. as to your comment about pooling risk and setting priorities, have you any idea what that means? as a doctor i can tell you that treatment must be different for every patient because every body is different and each condition presents uniquely with this combination. medicine is not a one size fits all; hence, risk is not a one size fits all. the true priority is the quality and length of a person's life. anyone who would compromise a doctor being able to help a patient achieve that has no right being part of the healthcare system and setting priorities within it. and where do you come from suggesting bringing down the cost of doctors? if anyone in society should be reimbursed fully for what they have given (many many yrs and six figure debt), it should be doctors and teachers. when you stop paying these people to do what they do, to do it well, the whole country pays a price. if you were really interested in bringing down costs of doctors, you ought to be suggesting tort reform. with respect to iran, ahmadinejad is out of control and he'd kill you and your family as soon as he's given the chance. i think america and president obama understand that most iranians however are good people who condemn what ahmadinejad has done and therefore would not strike against them so long as the government will stop threatening nuclear warfare with its actions.